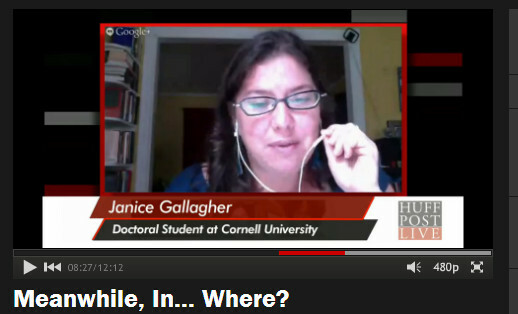 Gallagher was in Colombia from 2006 to 2008 doing human rights accompaniment with the Fellowship of Reconciliation and returned this year as part of her doctoral research. She noted the hope on the part of the Colombian people with regard to the current peace negotiations taking place in Havana, Cuba, between the Colombian government and the Fuerzas Armadas Revolucionarias de Colombia (FARC), the country’s largest armed opposition group: “Everybody on all sides of this issue is tired of the violence. They’re tired of the norm being that of a society that is not fundamentally safe,” Gallagher said. “In April, by some estimates there were nearly a million people in the streets, demanding peace, showing that they support a change in the status quo,” she continued. See the full video interview here. Gallagher’s segment of the interview begins at 6:00 on the video.